Groundwater Relief offers two specific services to support organisations and individuals engaged in emergency water supply. In order to make appropriate decisions on water supply, you need to know what water resources are available. Groundwater Relief can provide rapid information on groundwater availability through a remote desk study through reviewing and analysing remote sensing data, geological and hydrogeological maps, groundwater data and available literature. Through our membership of groundwater experts we can source a large repository of information. We provide interpretation of the data sourced through practically focused reports and GIS mapping tools that can be taken on and used by engineers in the field. Groundwater Relief is developing a roster of experienced hydrogeologists who can deploy rapidly to the field, with equipment. The unit aims to be able to respond to requests within 7 days of being contacted. Please note that this response time is not yet guaranteed and Groundwater Relief is seeking funding to support this service. With less than one week notice a hydrogeologist travelled to Paoua, Central African Republic (CAR) to support Medecins Sans Frontieres France in drilling a new borehole for Paoua Hospital. The hydrogeologist brought equipment to support the work including data loggers, GPS and water quality analysis equipment. 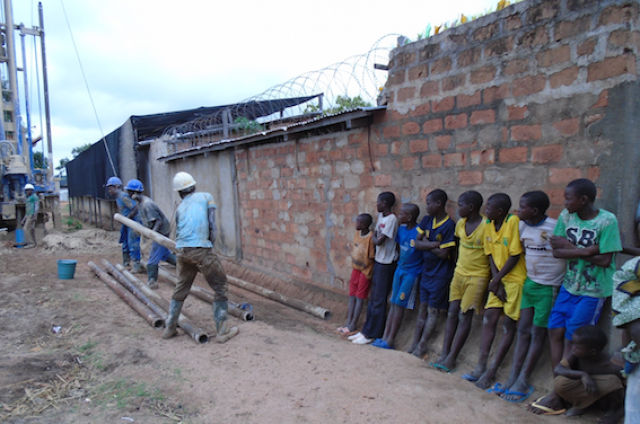 Following a geophysical survey, two boreholes were drilled successfully, one at the hospital and one at the field base. The hospital borehole was the most productive borehole in the locality according to records obtained from the National Water Supply and Sanitation Agency (ANEA: Agence Nationale de l’Eau et de l’Assainissement). On behalf of the Office of U.S. Foreign Disaster Assistance (OFDA) Groundwater Relief carried out a rapid assessment of groundwater availability at an IDP camp in Juba. The assessment was completed within 8 days of receiving the request. The study, supported by remote sensing information, found that groundwater availability below the site itself was limited, but a large regional fracture zone was identified to the north of the camp.